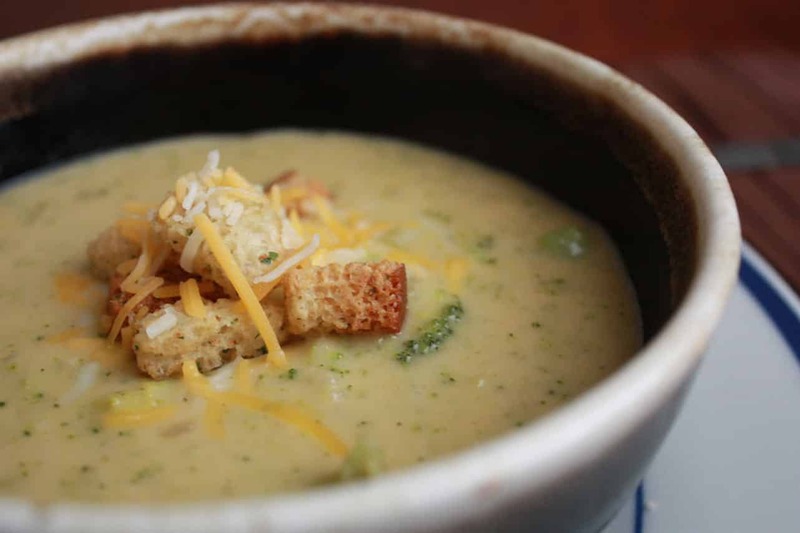 Broccoli cheddar ale soup | Naturally. There are times in the fall that the days feel perfect. The air has a crisp bite, the sky seems so blue, and the trees changing feel like a scene out of a movie. That is why I love fall. Even more perfect, homecoming was in full swing. The day was exhausting but the fantastic weather helped. I feel so lucky to be part of a such a great music program. The work may be exhausting but at the end of the day, the satisfaction I get from music cannot be beat. Music in the fall, two loves that always put me in a good mood. Last week was rough (see previous article.) I gave up on Friday. I got tired of homework and rushing around. I took two hours for lunch and make soup. The day called for soup- cold, dark, and dreary. I found a recipe that was not broccoli cheddar soup but I used it anyway. The end result: Broccoli Cheddar Ale soup. I used skim milk, chicken broth, and olive oil to lighten up the recipe (the original called for using bacon and bacon grease. Add the oil to a large heavy-bottomed pot set over medium-high heat. Add the onions and cook until the onion is translucent, add the green onion and garlic, dry mustard, a small pinch of sea salt, and a crank of fresh ground pepper. Saute for slightly longer until green onions get soft. Sprinkle in the flour and cook for another 3 minutes, stirring so it is well incorporated. Pour in the beer and cook until the liquid reduces by half (you will notice the beer smell evaporating) about seven minutes. Whisk in the milk, 1 cup of stock, and broccoli. Continue to cook for about 10 minutes. Add the grated cheddar into the puree in batches, stirring frequently until it melts (keep the soup at a simmer and don’t allow it to boil). When all of the cheese has melted, check for consistency – if you would like the soup a bit thinner, add the reserved stock. I used your recipe. It was really good! Thanks. Just what I was looking for. It is still so cold here in Seattle. This soup warmed me right up. I made it with a leek instead of green onions. I also added cauliflower. Just tried this recipe. I sued half of the bottle of ale and the outcome was terrible.! We could taste the bitterness and strong taste of ale. Do you have any ideas what went wrong? or it’s supposed to taste this way? Please list calories, sodium, etc. Where can I find the original recipe with the bacon and bacon grease? Thanks in advance! Oh gosh, in all the moves my site has gone through, the link must have gotten lost. I’ll check around and see if I can find it! if you’re interested, I can send you (backstream) another very cool blenderized sharp-cheese and ale soup recipe which is packed with veggies and fresh herbs but still remains acceptably low-carb even though it also contains apples (!). I’ve modified the heck out of it ever since I first got the idea from somebody else’s recipe online; it’s practically unrecognizable compared to the original so I now confidently call it my own. I LOVED this recipe. It was so delicious. I’m making it again but doubling it so I have leftovers. I made it just as listed and it was wonderful. I made this recipe and thought the broth was DELICIOUS. It was everything I hoped it would be. The problem was that about part way through adding the cheese it began to congeal around the broccoli, resulting in a gloppy mess. I made sure to keep the temperature low throughout the adding process, but it did not help. My husband and I – who put cheese on EVERYTHING – couldn’t even stomach how much cheese was in the glop. I absolutely loved the flavour though so I am making it again tonight – any suggestions on improving the consistency? I am going to start by halving the amount of cheese and we’ll see how that works. On the plus side, the glop did not go to waste. We saved it separate from the broth, and the next night I mixed it with rice and made stuffed tilapia fillets. They too were very good! Sorry for such a delayed response back- I’ve been under the weather! Honestly, it’s been SO long since I’ve made this recipe but I would cut way back on the cheese (probably to 2 cups). Let me know if you did anything different when you made it again! What kind of ale do you use/do you have any recommendations?